Vinyl has been a popular choice for flooring and wallpaper throughout the modern era, and many vinyl building materials manufactured before 1980 had asbestos mixed in to increase their durability. Vinyl is a plastic resin manufactured from ethylene and chlorine. The substance is sturdy yet flexible, easy to wash and cheap to install and replace. In addition, vinyl products can be manufactured with almost any color and texture, allowing them to provide the appearance of wood, stone and other traditional building materials at a tiny fraction of the cost. During the last century, vinyl manufacturers often mixed asbestos into their products for greater strength and insulating properties, and construction companies favored asbestos-containing materials of all kinds as an essential component of fire-resistant buildings. Because both vinyl and asbestos were inexpensive and easy to work with, asbestos vinyl products became widespread. Vinyl wallpaper: Vinyl has been used in wallpaper for more than a century, and today most wall coverings are either vinyl-coated paper or solid vinyl with a cloth backing. Wallpaper was one of the earliest vinyl products to include asbestos. Vinyl floor tiles: Vinyl floor tiles are resilient and cheap, making them a logical choice for floors that must withstand constant wear and tear such as in businesses, schools and hospitals. Mixing asbestos into vinyl floor tiles made them more insulating and resistant to damage. Vinyl sheet flooring: Like floor tiles, vinyl sheet flooring is a long-lasting and economical material, and it also offers more aesthetic options to suit a homeowner’s taste. Unfortunately, vinyl sheet flooring manufactured with an asbestos backing poses a serious exposure risk when it is disturbed. Asbestos has been used in vinyl wallpaper since the 1920s, and vinyl floor tiles and sheet flooring rose to prominence in the 1950s. The wondrous new “no-wax” flooring sold by companies such as Congoleum put a glossy sheen on post-war American prosperity. Stain-proof, fireproof, stylish and affordable, vinyl products fortified by asbestos promised to help Americans leave the messiness and peril of the World War II years behind them. The long latency of asbestos-related diseases meant the true cost of these products would not make itself known until the 1980s and 1990s. Cancer and lung diseases hit hardest among the factory workers who had manufactured the asbestos vinyl products and the tradesmen who had installed them, and a wave of lawsuits filed by mesothelioma lawyers forced many companies to file for bankruptcy and set up trust funds for victims of asbestos exposure. Exposed to an Asbestos Product? Our Patient Advocates can answer your questions about asbestos exposure and help you find a top attorney. Today, the use of asbestos in new vinyl materials has been largely phased out in the United States, but many homes, businesses and public buildings constructed before 1980 still contain old asbestos vinyl flooring and wallpaper. It is also worth noting that the use of asbestos in vinyl floor tiles and wallpaper still has not been fully banned by the United States government. Asbestos in vinyl products becomes dangerous when microscopic fibers of the mineral are released and become airborne. If the material is in good condition, it normally does not pose a threat, because the asbestos is enclosed in vinyl, preventing the fibers from escaping. Tile and wallpaper products are considered nonfriable, which means the products are not easily broken by slight pressure. However, cutting, sanding or disturbing vinyl tiles or wallpaper can release asbestos. If inhaled or swallowed on a regular basis over a long period of time, asbestos fibers can cause a number of serious illnesses such as asbestosis and mesothelioma. The mastics or adhesives used to install vinyl products also often contained asbestos, though asbestos fibers in adhesives are less likely to become airborne. Asbestos vinyl sheet flooring poses a significantly greater asbestos exposure risk than floor tiles or wallpaper. Vinyl sheet flooring comes in large pieces and is usually cut to the size of the room and laid down in one piece. Manufacturers often made this type of flooring with a friable asbestos backing, which means mineral fibers are easily released into the air if the sheet flooring is disturbed or damaged. Flooring installers and factory workers have the greatest risk of exposure. Vinyl flooring and wallpaper that contain asbestos cannot be recognized on sight. It is always safer to assume material manufactured before 1980 contains asbestos. Asbestos vinyl sheet flooring should only be removed by a licensed abatement professional. Abating asbestos vinyl wallpaper and floor tiles does not typically require a license because these materials are considered nonfriable, but the U.S. Environmental Protection Agency (EPA) always recommends contacting a professional for any abatement project. In the 1990s, a flooring contractor named Robert Ehret was diagnosed with mesothelioma and sued Congoleum Corporation along with several other flooring companies. Mr. Ehret had developed the cancer after being exposed to asbestos in the companies’ vinyl flooring products for more than 20 years. He died of the disease before his trial, but the jury awarded $3.3 million dollars for pain, suffering, loss of consortium and lost earnings to his wife and three children. In 2010, as part of Congoleum’s reorganization plan under Chapter 11 of the Bankruptcy Code, the corporation created the Congoleum Plan Trust. According to an annual report, it paid 943 personal injury claimants a total of more than $11 million in 2016, and the trust fund was worth more than $206 million overall. Asbestos-containing vinyl sheet flooring was often designed to resemble carpeting, wood or stone and was less expensive than these other types of flooring. State of Oregon Department of Environmental Quality. (2012). 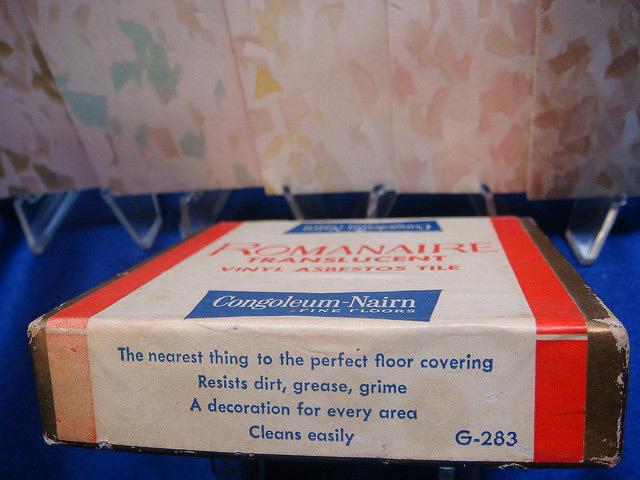 How to remove nonfriable vinyl asbestos floor tiles. Southwest Clean Air Agency. (n.d.). How to properly remove sheet vinyl flooring with asbestos. Research Well. (2010). ABI's estimated asbestos liability through 2015 could top $62 million.